on January 18, 2017, 12:24 p.m. 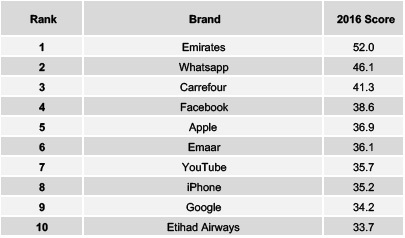 The 2016 annual BestBrand Rankings released by YouGov using our flagship daily brand tracker, BrandIndex have crowned national airline Emirates, mega food and beverage manufacturer, Almarai and world renowned social media giant Facebook as the most positively perceived brands in three Middle East countries for 2016. With 2016 coming to a close, the Annual BrandIndex Buzz Rankings have been released, and we’ve compiled a set of highlights for you below. The BrandIndex Buzz Rankings use the BrandIndex Buzz score – which measures whether respondents have heard something positive or negative about a brand recently* – to calculate two sets of results; the top performers in terms of Buzz over the entirety of 2016, and the top improvers since 2015. These results are then broken down to the overall Top 10 list, as well as the Top 5 list per sector (for the most relevant sectors in each region). * Buzz scores range from 100 to -100 and are compiled by subtracting negative feedback from the positive. A zero score means equal positive and negative feedback. All scores have been rounded to a single decimal place, however additional precision was used to assign ranks. The past year saw Emirates face highs and lows, however the airline brand seems to have capitalized on the positive and softened the negatives. The airline most notably caught consumer attention with brand Ambassador Jennifer Anniston reappearing in a new advertising campaign for 2016, Emirates has continued to receive the highest brand Buzz scores of over 400 brands in the UAE this year, retaining its crown as the number 1 brand in the UAE Buzz rankings. Carrefour enters the Top 10 Rankings for the first time, the UAE’s premier Hypermarket has seen a steady increase in 2016, landing it as the only new entry into the UAE BrandIndex Rankings. Emaar has continued its rise in Buzz, with an impressive jump of four places in the Rankings to sit at sixth overall. In fact the real estate brand has generated far more Buzz than any of its competitors within the real estate development sector. Apple and iPhone both retain their place in the Top 10 Rankings, but drop lower in the ranks after mixed responses to the iPhone 7. Samsung has fallen out of the Top 10 spot for the first time since the Rankings began in 2012, after finishing at the top of the table just two years prior in 2014. Global Village climbs from third to first in the Leisure and Entertainment sector, while also climbing to the very top of the Top 10 overall Improvers and the Leisure and Entertainment Improvers, earning the brand three crowns this year. Danube Properties’ unique offering has managed to create significant Buzz for the brand, with the affordable Real Estate Developer earning a place in the sector rankings, after only launching their first project in 2014-15. Huawei earns second place in the Top 10 Improvers, they have focused on products that meet the needs of various social segments, in particular the Y family of products which meet the needs of the middle class youth demographic and smart phones novices and it seems to be making an impact. Almarai has continued to win positive appeal amongst residents throughout 2016 holding on to the number 1 position, with the brand’s ‘mother’s milk’ video igniting social media both locally and globally, becoming the second most shared video on YouTube in the world in just one week and came in globally as the 7th most shared video of 2016. Whatsapp, has moved up substantially in the Buzz rankings - from fifth place in 2015, to second place in 2016. The introduction of end-to-end encryption providing full protection to users’ privacy was a welcome comfort to WhatsApp account holders in the Kingdom this year. Samsung has come in at seventh place after falling from second place in the 2015 rankings. Samsung has gone through a tough period with the company recall of some 2.5 million note 7 devices following multiple battery issues worldwide, however Samsung has still maintained high levels of positive Buzz in the Kingdom throughout 2016. Apple and iPhone both retain their place in the Top 10 Buzz Rankings, with the Saudi population taking the release of the iPhone 7 and other various products more positively than their neighbours in the UAE. Mobily and Zain top the Top 10 Improvers, while Huawei enjoys a positive year in the country and earns sixth place in the same rankings. 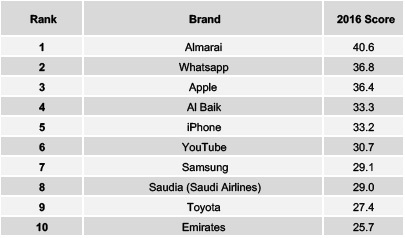 Saudia, earns a place in the Annual BrandIndex Buzz Rankings for the first time (in eighth place), after a stellar start to the year saw them also entering the Mid-Year Rankings. Rival airline Emirates’ stellar Buzz this year doesn’t seem to be limited to the UAE, with the brand earning a place in the Top 10 Rankings in KSA for the first time. Toyota is another brand that has entered the Top 10 Rankings for the first time this year, after numerous awards and accolades saw the brand generate significant Buzz in the region. 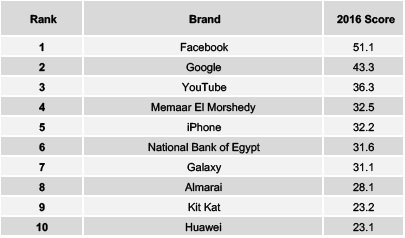 The Top 10 Rankings In Egypt continue to be dominated by global brands, with Facebook, Google and YouTube maintaining their positions at the top. Memaar Al Morshady enter the Rankings for the first time, with the local brand gaining serious Buzz thanks to their recent advertising campaigns targeting young financially-independent males. National Bank of Egypt manages to remain in the Top 10 Rankings, likely thanks to their extensive TV and Online advertising campaigns in the past year. Huawei has managed to capitalize on the growing gap in the market, especially with their latest Y model phones, earning them a place in this year’s Top 10 Rankings. While rival phone manufacturer Samsung loses its position in the Top 10 in yet another market. iPhone gains further ground after the introduction of the flagship iPhone 7 handsets, rising from seventh to fifth. Om Hassan soars to the top of the Top 10 Improvers, marking it as yet another of the local brands to make it into the rankings. Beauty with Brands! What brands do beauty conscious women seek?